For years, hundreds of thousands of visitors have traveled to Lake of the Ozarks to enjoy the beauty and recreation of this area. Now with the rapid development of the area, many of the weekenders are purchasing their second homes or becoming full time residents. The lake covers an astounding 54,000 acres, impounds 646 billion gallons of water and has 1,150 miles of coved indented shoreline - this is more than the state of California! 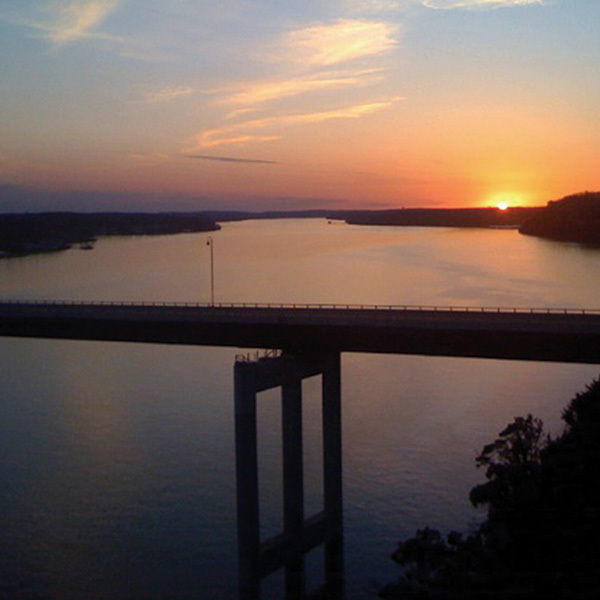 The Lake of the Ozarks is the area that the Krantz Team is happy to call home. It’s the place where we raise our families, have a career, spend time with friends, enjoy the seasons, and so much more! The lake area is very relaxing and exciting. In our Mid-Missouri paradise, you can enjoy 1,150 miles of shoreline! Anyone can have a beautiful waterfront home or condo along with a dock. The Lake of the Ozarks is found in the heart of Missouri, located only a few hours from major cities such as St. Louis, Kansas City, Chicago, and Des Moines. The lake area also has a large international population, such as Russian, German, and English. The lake offers something for the adventurous and the tranquil. It is ideal for everyone, young and old. The lake area is one of the best places to take a vacation, and often these vacationers decide to become second homeowners or to become full time residents. Vistors can enjoy fishing, take the boat out for the day, hiking at Ha Ha Tonka State Park, a guided tour at Bridal Cave, or just relax on the dock. The lake area is also known for its extensive golfing activities. There are 225 holes of champion golf courses with hazards and terrain that appeal to everyone from beginners to seasoned professionals. With a golfing season that runs virtually year round, visitors can play golf whenever they choose. The Lake of the Ozarks has a number of fine eating establishments that range from Tex-Mex, Italian, Seafood, and Steakhouses. The lake has recently acquired many new restaurants, such as The Outback Steakhouse, Chili’s, Applebee’s, and Culvers. Whether you like hamburgers or caviar, you are sure to find it here at the Lake of the Ozarks. Another major attraction here at the lake is the Osage Beach Premium Outlets. This shopping mall has 110 famous brand name outlet stores that offer savings of 25% to 70% off of designer labels. This mall is sure to result in a rewarding shopping experience for the whole family. In addition, the lake area has a popular water park, Big Surf, which has a variety of waterslides, rides, and attractions! The lake is a growing area. Several businesses have built establishments here in only the last few years. Now, the area has a HyVee, a major grocery store, a remodeled Super Wal-Mart, The Outback Steakhouse, Chile’s, and many others. The newest developments to come are national retail chains, such as CVS Pharmacy, Kohl's Department Store, and Menards Home Improvement Store. These businesses have brought many employment opportunities to the lake area as well. In addition, the Lake of the Ozarks has an extremely low crime rate and Triple A rated schools. The hospital is also highly rated, featuring top flight cardiovascular services and state of the art diagnostic and treatment options. With all of these wonderful attractions and the security of living in a safe community, why wouldn’t you want to be living at the lake? Contact us to receive additional Lake of the Ozarks information, whether on real estateor the several communities, including Lake Ozark, Osage Beach, Eldon, Camdenton, Sunrise Beach, Laurie, Macks Creek, Montreal, Linn Creek, Rocky Mount, Four Seasons, Porto Cima, and The Villages. The Lake turned 75 Years Old in 2006! Bagnell Dam began construction in August 6, 1929 by Union Electric Company of St. Louis, now known as Ameren UE, and was considered the largest man-made lake in the world! This skillful engineering feat, known as the Great Osage River Project was completed in April of 1931. Before the spectacular area became the Mid-west's boating, shopping, dining, and golf mecca, as we know it today, the Osage Indians settled in the beautiful Ozark hills. Though, Lewis and Clark were the first to describe the natural wonders of the Ozark mountains. Civil War, expansion to the west, and railroads all contributed to the development of this area, long before the Osage River was dammed.